For as long as I can remember my parents have always hung maps in our home. My mum & dad were never into displaying family photos up the stairway and even though I sometimes wished they did (I even gifted them a picture of me to hang going up the stairs...ha ha, can you say vain?!) now whenever I see maps hung up in people's houses it makes me feel very nostalgic. 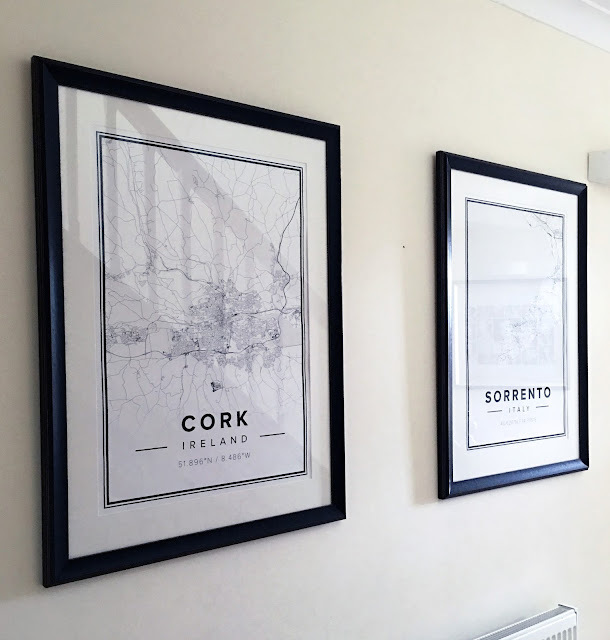 So when I saw these Mapiful posters I felt like this would be the perfect addition to my own home and would be a great way to honour my parents' tradition but in a slightly more modern way. Basically how it works is you insert a place name or location that is special to you into the website, and it creates a poster using the coordinates of that meaningful place. You can then customise the map by zooming in/out, changing the text and choosing the visual theme of your poster. 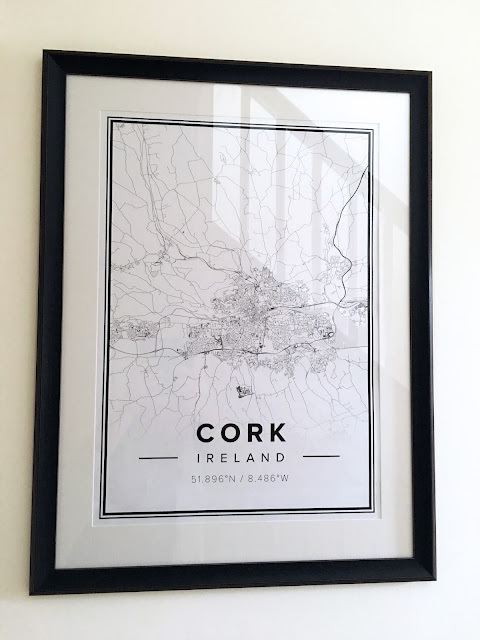 For our home I chose Sorrento, Italy (the place where Jonathan & I got married) and Cork, Ireland (where we met). I absolutely love how they turned out and have hung them near our stairway just like my parents did in the house where I grew up! If you'd like to create your own custom map posters, you can get 15% off with the discount code SACCONE16 until the 5th of July. I think these are gorgeous Anna! I love how you can customise them to suit your style! I loved these prints when I saw them in the vlog. They look so gorgeous in black and white! These are beautiful! I love them, very stylist and minimalistic!! This is such a fantastic idea! The prints look fantastic, really eye-catching but subdued enough to go with however else you decorate the space! 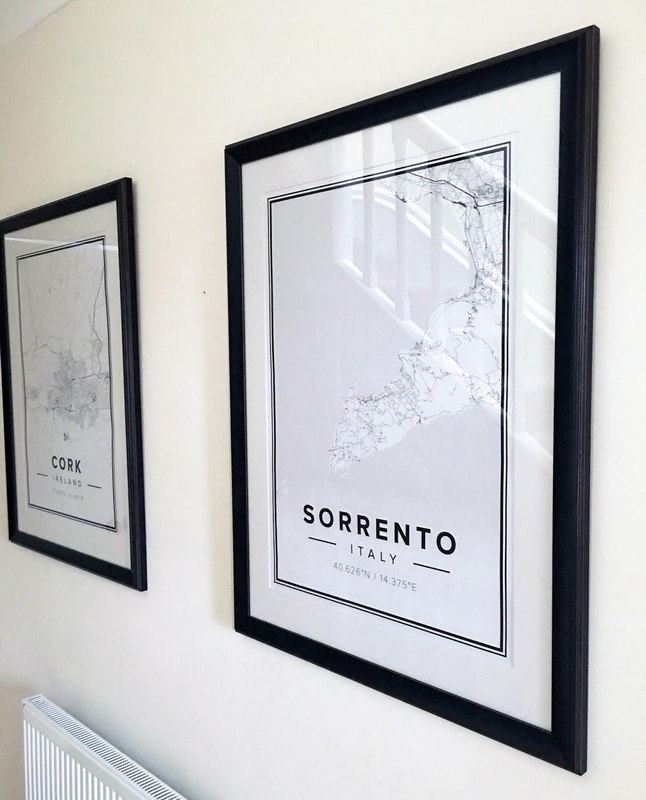 I love using maps as a decor, especially when the place is dear to you! This are beautiful! I love that you are keeping your family tradition alive. Maybe one day Emilia and Eduardo will do the same in their family homes! I fell in love with your blog. Love these posters! Such nice accents to add to your home! This is a beautiful idea! Wow, what a great idea and lovely tradition. I am really thinking about adopting this, the posters look beautiful. We are not into family-pictures-on-the-wall, too. This is such a nice idea! Very beautiful idea!! I love it! That's such a nice idea. I got a scratch map of Europe for my birthday and this will go perfectly together. Love this idea Anna - great way of honouring some memories. Do they come already framed? I love them! I may order couple of my own! I've been living in Dublin but I'm from Brazil and you have no idea how your videos and posts here help me with my English (btw, I'm sorry if it has some mistake). You're an inspiration for me. You're a fantastic mom, a incredible woman. You're so strong and confident but at the same time so human, with all your own difficulties and insecurities. I think that's why I feel like you're my friend and your followers like you so much! I really admire you, thank you for every second you spend with us. Ah! If you're in Ireland again I'd looooove see you! What size map did you get and where are the frames from? I love this! I definitely want to do it! 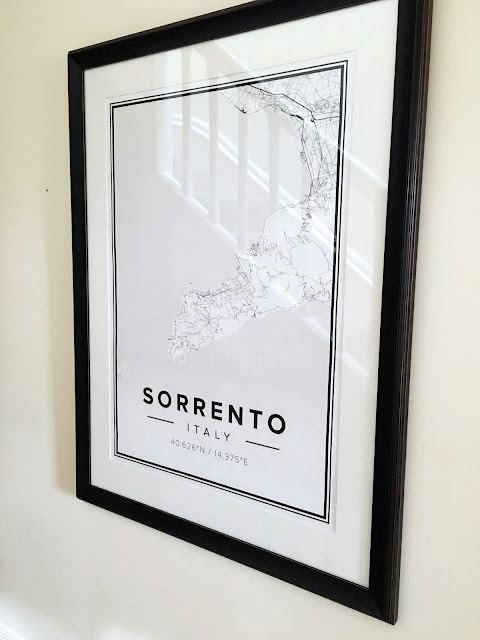 Was wondering what sizes are the posters and where did you get your frames? Thanks! Hi Anna ! Too bad I saw your post today... I love the pictures, it's so cool. I want one of Toulouse, it's in the south-west of France. I'm happy to see you again in the vlog. Amei o post! Com uma excelente escrita e conteudo :) Beijinhos! I know it's a paid ad and all that, but this is quite cool. I especially like that I can customize all the fields. Oh wow, these are a brilliant idea for a gift. Love them. Anyway, I just want to say thank you so much for being so brave and so honest, I think many will really benefit from hearing this from someone like yourself. You've got a huge platform to put this word out onto and I hope this can help others reach out for help or at least help reduce the amount of body shaming comments on videos on YouTube and in real life. I too would love to share my recovery story, in the hopes that I can help others, but it scares me as I worry if anyone commented nastily, it may send me backwards! I have a YouTube channel, but I've only started adding content recently, and it does worry me that if any comments appeared about my weight or my looks, just how well I will take it. I'm definitely stronger than I have ever been, but it does make me nervous! Anyway, if I do make a video about it, I'll call it 'Anna Saccone Made Me Do This' haha!! Basically you've really inspired me to share my story too in the hopes I can help others - as well as helping myself. As they say, a problem shared is a problem halved. Talking about your ED to people and having it common knowledge is something I've benefited from hugely, it means your behaviours are being watched and if you go through hard times, people know you need more support in order not to slip back to old unhealthy habits. This is such a lovely post. I love how something so simple like these maps can mean the world to someone when to another person they have a completely different meaning. The nostalgic feel behind this post and the relevance of the maps to you really shines through. I love how you are honouring your parents' tradition! I love this idea. They look gorgeous! This is such a great idea!! I'm giving this a try! Thank you! Saw you latest video. Sending all my love and well wishes to you Anna. Thank you for making such a positive impact in the world by sharing your struggles. Fusion is the need of the hour and atSegal Jewellery we blend the past and present to make the unique designs. You are a wonderful family! I admire you so much Anna and I really like your style! Wish you were my sister! Anna I've been checking your blog religiously and no new blogs...... Ive been enjoying reading them since day one! miss them so...Are you writing on a new blog or where can I read some more of your Blogs? Such a great idea, even for a gift!! My dad works and travels around the city and he also loves map. I'm thinking present for the nect occasion :-) thanks Anna!! Look so cute! I'm decorating my house, and your post makes me have some ideas.